Horseman, Pazyryk felt artifact, c.300 BC. For another felt artifact, see here. The Pazyryk[a] burials are a number of Saka Iron Age tombs found in the Pazyryk Valley of the Ukok plateau in the Altai Mountains, Siberia, south of the modern city of Novosibirsk, Russia; the site is close to the borders with China, Kazakhstan and Mongolia. Numerous comparable burials have been found in neighboring western Mongolia. The tombs are Scythian-type kurgans, barrow-like tomb mounds containing wooden chambers covered over by large cairns of boulders and stones, dated to the 4th–3rd centuries BCE. The spectacular burials at Pazyryk are responsible for the introduction of the term kurgan, a Russian word of Turkic origin, into general usage to describe these tombs. The region of the Pazyryk kurgans is considered the type site of the wider Pazyryk culture. The site is included in the Golden Mountains of Altai UNESCO World Heritage Site. Because of a freak climatic freeze, some of the Altai-Sayan burials, notably those of the 5th century BCE at Pazyryk and neighbouring sites, such as Katanda, Shibe, and Tuekt, were isolated from external climatic variations by a protective layer of ice that conserved the organic substances buried in them. Certain geometric designs and sun symbols, such as the circle and rosette, recur at Pazyryk but are completely outnumbered by animal motifs. Such specifically Scythian features as zoomorphic junctures, i.e. the addition of a part of one animal to the body of another, are rarer in the Altaic region than in southern Russia. The stag and its relatives, however, figure as prominently in Altai-Sayan as in Scythian art. "At Pazyryk too are found bearded mascarons (masks) of well-defined Greco-Roman origin, which were doubtless inspired by the Hellenistic kingdoms of the Cimmerian Bosporus." The first tomb at Pazyryk, barrow 1, was excavated by the archaeologist M. P. Gryaznov in 1929; barrows 2-5 were excavated by Sergei Ivanovich Rudenko in 1947-1949. While many of the tombs had already been looted in earlier times, the excavators unearthed buried horses, and with them immaculately preserved cloth saddles, felt and woven rugs including the world's oldest pile carpet, a 3-metre-high four-wheel funeral chariot from the 5th century BC and other splendid objects that had escaped the ravages of time. These finds are now exhibited at the Hermitage Museum in Saint Petersburg. Craniological studies of samples from the Pazyryk burials determined that skulls were generally of Europoid type, with some showing Mongoloid features. Rudenko's most striking discovery was the body of a tattooed Pazyryk chief: a thick-set, powerfully built man who had died when he was about 50. Parts of the body had deteriorated, but much of the tattooing was still clearly visible (see image). Subsequent investigation using reflected infrared photography revealed that all five bodies discovered in the Pazyryk kurgans were tattooed. No instruments specifically designed for tattooing were found, but the Pazyryks had extremely fine needles with which they did miniature embroidery, and these were probably used for tattooing. The chief was elaborately decorated with an interlocking series of striking designs representing a variety of fantastic beasts. The best preserved tattoos were images of a donkey, a mountain ram, two highly stylized deer with long antlers and an imaginary carnivore on the right arm. Two monsters resembling griffins decorate the chest, and on the left arm are three partially obliterated images which seem to represent two deer and a mountain goat. On the front of the right leg a fish extends from the foot to the knee. A monster crawls over the right foot, and on the inside of the shin is a series of four running rams which touch each other to form a single design. The left leg also bears tattoos, but these designs could not be clearly distinguished. In addition, the chief's back is tattooed with a series of small circles in line with the vertebral column. This tattooing was probably done for therapeutic reasons. Contemporary Siberian tribesmen still practice tattooing of this kind to relieve back pain. The most famous undisturbed Pazyryk burial so far recovered is the Ice Maiden or "Altai Lady" found by archaeologist Natalia Polosmak in 1993 at Ukok, near the Chinese border. The find was a rare example of a single woman given a full ceremonial burial in a wooden chamber tomb in the fifth century BC, accompanied by six horses. She had been buried over 2,400 years ago in a casket fashioned from the hollowed-out trunk of a Siberian larch tree. On the outside of the casket were stylized images of deer and snow leopards carved in leather. Shortly after burial the grave had apparently been flooded by freezing rain, and the entire contents of the burial chamber had remained frozen in permafrost. Six horses wearing elaborate harnesses had been sacrificed and lay to the north of the chamber. The maiden's well-preserved body, carefully embalmed with peat and bark, was arranged to lie on her side as if asleep. She was young, and her hair was shaven off but she was wearing a wig and tall hat; she had been 167 centimetres (5 ft 6 in) tall. Even the animal style tattoos were preserved on her pale skin: creatures with horns that develop into flowered forms. Her coffin was made large enough to accommodate the high felt headdress she was wearing, which was decorated with swans and gold-covered carved cats. She was clad in a long crimson and white striped woolen skirt and white felt stockings. Her yellow blouse was originally thought to be made of wild "tussah" silk but closer examination of the fibers indicate the material is not Chinese but was a wild silk which came from somewhere else, perhaps India. Near her coffin was a vessel made of yak horn, and dishes containing gifts of coriander seeds: all of which suggest that the Pazyryk trade routes stretched across vast areas of Iran. Similar dishes in other tombs were thought to have held Cannabis sativa, confirming a practice described by Herodotus but after tests the mixture was found to be coriander seeds, probably used to disguise the smell of the body. Two years after the discovery of the "Ice Maiden" Dr. Polosmak's husband, Vyacheslav Molodin, found a frozen man, elaborately tattooed with an elk, with two long braids that reached to his waist, buried with his weapons. Doctor Anicua also noted that her blouse was a bit stained, indicating that the material was not a new garment, made for the burial. One of the most famous finds at Pazyryk is the Pazyryk carpet (Persian: فرش پازیریک‎), which is probably the oldest surviving pile carpet in the world. It measures 183×200 cm and has a knot density of approximately 360,000 knots per square meter, which is higher than most modern carpets. The middle of the carpet consists of a ribbon motif, while in the border there is a procession with elk or deer, and in another border warriors on horses. The Pazyryk carpet was manufactured in Ancient Armenia (one of hypotheses)around 400 BC. When it was found it had been deeply frozen in a block of ice, which is why it is so well-preserved. The carpet can be seen at the Hermitage Museum in Saint Petersburg, Russia. In a corner of one grave chamber of the Pazyryk cemetery was a fur bag containing cannabis seed, a censer filled with stones, and the hexapod frame of an inhalation tent – these are believed to have been utilized at the end of the funerary ritual for purification. Other undisturbed kurgans have been found to contain remarkably well-preserved remains, comparable to the earlier Tarim mummies of Xinjiang. Bodies were preserved using mummification techniques and were also naturally frozen in solid ice from water seeping into the tombs. They were encased in coffins made from hollowed trunks of larch (which may have had sacral significance) and sometimes accompanied by sacrificed concubines and horses. The clustering of tombs in a single area implies that it had particular ritual significance for these people, who were likely to have been willing to transport their deceased leaders great distances for burial. As recently as the summer of 2012, tombs have been discovered at various locations. In January 2007 a timber tomb of a blond chieftain warrior was unearthed in the permafrost of the Altai mountains region close to the Mongolian border. The body of the presumed Pazyryk chieftain is tattooed; his sable coat is well preserved, as are some other objects, including what looks like scissors. A local archaeologist, Aleksei Tishkin, complained that the indigenous population of the region strongly disapproves of archaeological digs, prompting the scientists to move their activities across the border to Mongolia. Rudenko initially assigned the neutral label Pazyryk culture for these nomads and dated them to the 5th century BC; the dating has been revised for barrows 1-5 at Pazyryk, which are now considered to date to the 4th-3rd centuries B.C. The Pazyryk culture has since been connected to the Scythians whose similar tombs have been found across the steppes. The Siberian animal style tattooing is characteristic of the Scythians. Trading routes between Central Asia, China and the Near East passed through the oases on the plateau and these ancient Altai nomads profited from the rich trade and culture passing through. There is evidence that Pazyryk trade routes were vast and connected with large areas of Asia including India, perhaps Pazyryk merchants largely trading in high quality horses. There is also the possibility that the current inhabitants of the Altai region are descendants of the Pazyryk culture, a continuity that would accord with current ethnic politics: Archaeogenetics is now being used to study the Pazyryk mummies. ^ de Laet & Herrmann 1996, p. 443 "The rich kurgan burials in Pazyryk, Siberia probably were those of Saka chieftains"
^ Kuzmina 2008, p. 94 "Analysis of the clothing, which has analogies in the complex of Saka clothes, particularly in Pazyryk, led Wang Binghua (1987, 42) to the conclusion that they are related to the Saka Culture." ^ Kuzmina 2007, p. 103 "The dress of Iranian-speaking Saka and Scythians is easily reconstructed on the basis of... numerous archaeological discoveries from the Ukraine to the Altai, particularly at Issyk in Kazakhstan... at Pazyryk... and Ak-Alakha"
^ a b c d "Ice Mummies: Siberian Ice Maiden". PBS – NOVA. Retrieved 2009-09-01. ^ A Special Issue on the Dating of Pazyryk. Source: Notes in the History of Art 10, no. 4, p. 4. ^ a b Bahn, Paul G. (2000). The Atlas of World Geology. New York: Checkmark Books. p. 128. ISBN 0-8160-4051-6. ^ "Altaic Tribes". Encyclopædia Britannica Online. Encyclopædia Britannica. Retrieved December 5, 2016. ^ Grousset, Rene (1970). The Empire of the Steppes. Rutgers University Press. pp. 18–19. ISBN 0-8135-1304-9. ^ "Rug and carpet: Oriental carpets". Encyclopædia Britannica Online. Encyclopædia Britannica. Retrieved March 2, 2015. ^ "Central Asian Arts: Altaic tribes". Encyclopædia Britannica Online. Encyclopædia Britannica. Retrieved March 2, 2015. ^ Rudenko 1970, p. 45 "Although in general the skulls in the series are of europeoid type, there are some among them with markedly mongoloid features." ^ Findings published in Archaeology, Ethnology and Anthropology of Eurasia, Spring 2005. ^ Polosmak, Natalia (1994). "A Mummy Unearthed from the Pastures of Heaven." National Geographic 186:4, p. 91. ^ Polosmak (1994), pp. 98-99. ^ "History of handknotted carpets". CarpetEncyclopedia.com. Retrieved March 2, 2015. ^ "Russian Archaeologists Discover Remains of Ancient Chieftain in Altai Permafrost". 2007-01-10. Archived from the original on 2007-03-02. Retrieved 2007-05-06. ^ Daria Radovskaya (2007-01-10). "Кочевник был блондином". Rossiyskaya Gazeta. Retrieved 2007-05-06. ^ See above, n. 2. ^ "Early Nomads of the Altaic Region". The Hermitage. Retrieved 2007-07-31. Kuzmina, Elena Kuzmina (2007). The Origin of the Indo-Iranians. BRILL. ISBN 900416054X. Kuzmina, Elena Kuzmina (2008). The Prehistory of the Silk Road. University of Pennsylvania Press. ISBN 0812240413.
de Laet, Sigfried J.; Herrmann, Joachim (1996). History of Humanity: From the seventh century B.C. to the seventh century A.D. UNESCO. ISBN 923102812X. Rudenko, Sergei Ivanovich (1970). Frozen Tombs of Siberia: The Pazyryk Burials of Iron Age Horsemen. University of California Press. ISBN 0520013956. Retrieved March 1, 2015. A kurgan is a tumulus, a type of burial mound or barrow, heaped over a burial chamber, often of wood. The Russian noun, already attested in Old East Slavic, borrowed by the Turks, compare Modern Turkish kurğan, which means "fortress". Kurgans are mounds of earth and stones raised over a grave or graves. Popularised by its use in Soviet archaeology, the word is now widely used for tumuli in the context of Eastern European and Central Asian archaeology. The Pazyryk culture is a Scythian nomadic Iron Age archaeological culture identified by excavated artifacts and mummified humans found in the Siberian permafrost, in the Altay Mountains, Kazakhstan and nearby Mongolia. The mummies are buried in long barrows similar to the tomb mounds of Scythian culture in modern Ukraine. 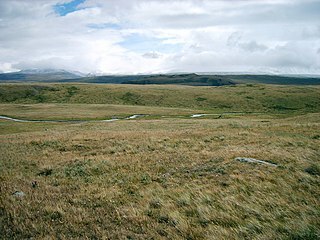 The type site are the Pazyryk burials of the Ukok Plateau. Many artifacts and human remains have been found at this location, including the Siberian Ice Princess, indicating a flourishing culture at this location that benefited from the many trade routes and caravans of merchants passing through the area. The Pazyryk are considered to have had a war-like life. Sergei Ivanovich Rudenko was a prominent Russian/Soviet anthropologist and archaeologist who discovered and excavated the most celebrated of Scythian burials, Pazyryk in Siberia. Ukok Plateau is a remote and pristine grasslands area located in the heart of southwestern Siberia, the Altai Mountains region of Russia near the borders with China, Kazakhstan and Mongolia. The plateau is recognized as part of the UNESCO World Heritage Site entitled Golden Mountains of Altai as an important environmental treasure. It provides a habitat for many of the world's endangered species including one of its least studied predatory animals: the snow leopard. Other endangered species protected there include the argali mountain sheep, the steppe eagle, and the black stork. There are several threats to the preservation of the Ukok Plateau, including overuse of the steppe by ranchers, a proposed road, and plans for a gas pipeline between China and Russia. The Issyk kurgan, in south-eastern Kazakhstan, less than 20 km east from the Talgar alluvial fan, near Issyk, is a burial mound discovered in 1969. It has a height of six meters and a circumference of sixty meters. It is dated to the 4th or 3rd century BC. A notable item is a silver cup bearing an inscription. The finds are on display in Astana. It is associated with the Saka peoples. Golden Mountains of Altai is the name of an UNESCO World Heritage Site consisting of the Altai and Katun Natural Reserves, Lake Teletskoye, Belukha Mountain, and the Ukok Plateau. As stated in the UNESCO description of the site, "the region represents the most complete sequence of altitudinal vegetation zones in central Siberia, from steppe, forest-steppe, mixed forest, subalpine vegetation to alpine vegetation". While making its decision, UNESCO also cited Russian Altai's importance for preservation of the globally endangered mammals, such as snow leopard and the Altai argali. The site covers a vast area of 16,175 km². The Prehistory of Siberia is marked by several archaeologically distinct cultures. In the Chalcolithic, the cultures of western and southern Siberia were pastoralists, while the eastern taiga and the tundra were dominated by hunter-gatherers until the late Middle Ages and even beyond. Substantial changes in society, economics and art indicate the development of nomadism in the Central Asian steppes in the first millennium BC. This list of Russian historians includes the famous historians, as well as archaeologists, paleographers, genealogists and other representatives of auxiliary historical disciplines from the Russian Federation, the Soviet Union, the Russian Empire and other predecessor states of Russia. The Siberian Ice Maiden, also known as the Princess of Ukok, the Altai Princess, Devochka and Ochy-bala, is a mummy of a woman from the 5th century BC, found in 1993 in a kurgan of the Pazyryk culture in Republic of Altai, Russia. It was among the most significant Russian archaeological findings of the late 20th century. 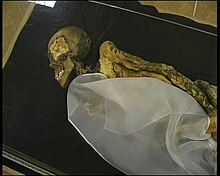 In 2012 she was moved to a special mausoleum at the Republican National Museum in Gorno-Altaisk. Horse burial is the practice of burying a horse as part of the ritual of human burial, and is found among many Indo-European peoples and others, including Chinese and Turkic peoples. The act indicates the high value placed on horses in the particular cultures and provides evidence of the migration of peoples with a horse culture. Human burials that contain other livestock are rare; in Britain, for example, 31 horse burials have been discovered but only one cow burial, unique in Europe. This process of horse burial is part of a wider tradition of horse sacrifice. An associated ritual is that of chariot burial, in which an entire chariot, with or without a horse, is buried with a dead person.